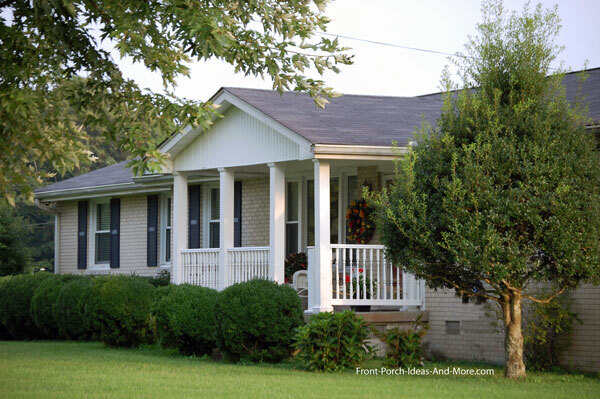 Ranch home porches not only add immense appeal but all also comfort and functionality. Mary and I grew up in ranch homes, but much to our dismay, many ranches are built without front porches as was ours. Because they normally have adequate front yard space, most ranch home designs are ideal for this outdoor living addition. 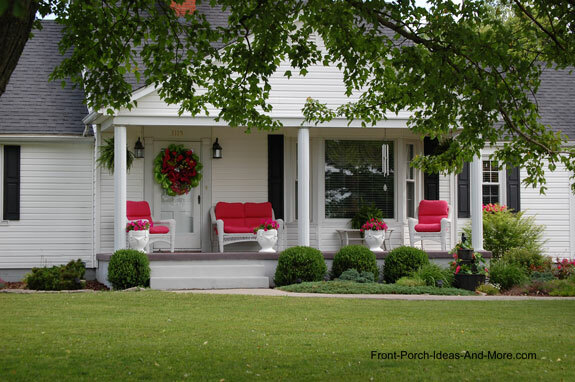 We are often asked what front porch design works best for ranch homes. 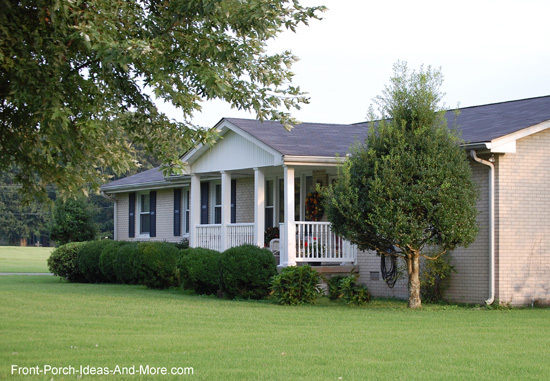 Ranch homes normally have low sloping roofs which can limit the porch's roof design but don't let that stop you. 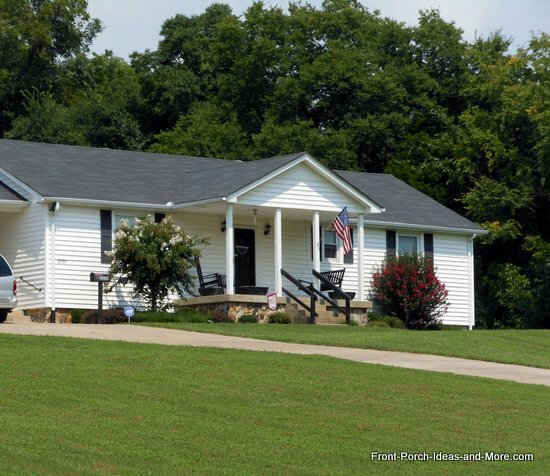 It is easy to see the beauty that a front porch makes on this ranch home. Ranch home porches rock. Billie's ranch home before a front porch was added. 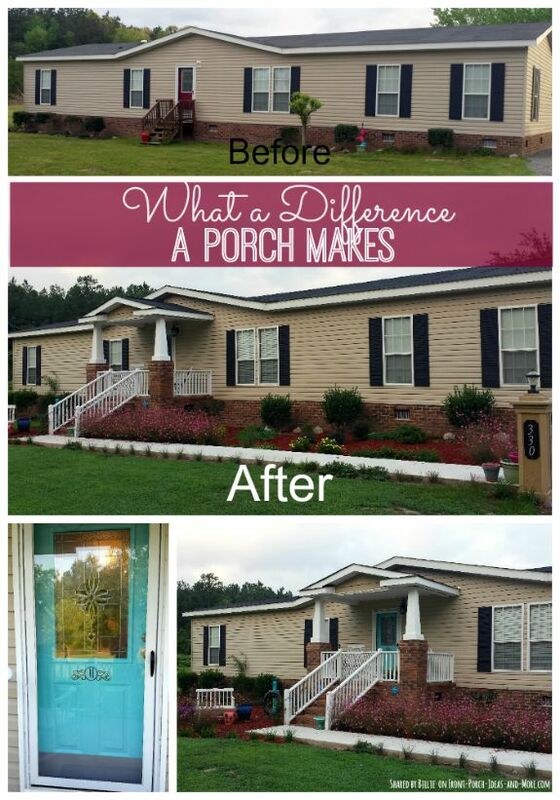 One of our readers, Billie, shares the wonderful transformation of her ranch home when they added a front porch. Above you can see that the home is very long and plain without the beauty of a front porch. She shared with us that it took 7 years to figure out the porch design that they would like. 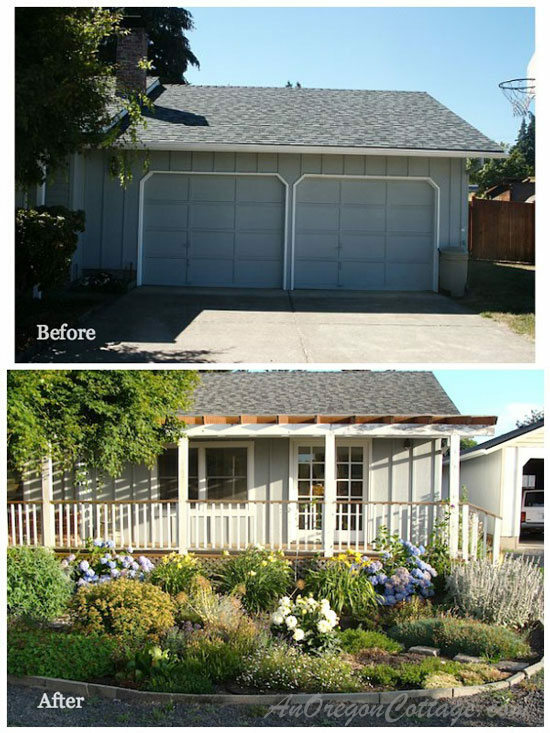 Lovely transformation with the addition of a porch and landscaping. 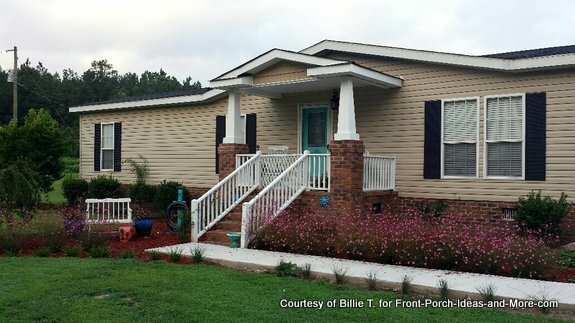 What a fantastic transformation the porch made on Billie's ranch home. The porch landscaping, of course, adds immense appeal too. 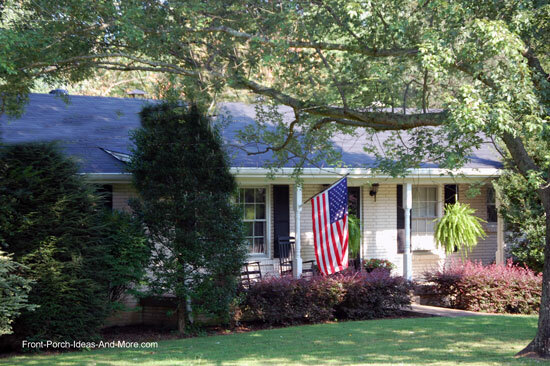 Isn't it amazing the beauty that a front porch with beautiful landscaping adds? We thank Billie for sharing her photos with us. 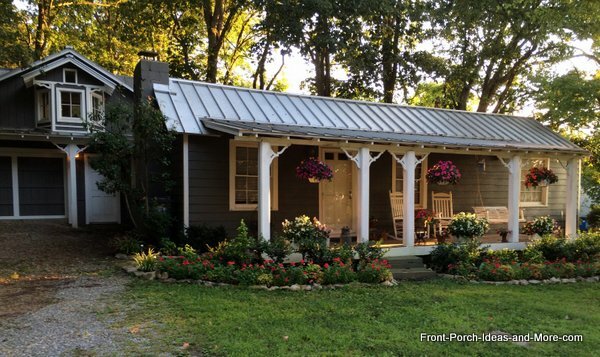 Never underestimate the appeal of a porch especially on a ranch home where the lines are long and simple. A super charming ranch that we saw on one of our road trips. From the wreath on the door to the cushions and the potted plants, beautiful! Ranch home construction essentially began in California in the 1940s and continued well into the 1970s. 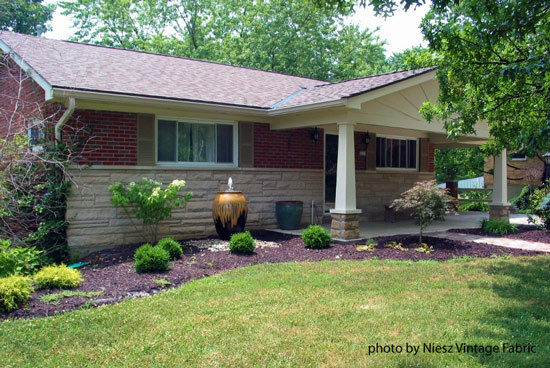 Their simplistic design was perfect for families after WWII which energized the growth of suburbs across the U.S.
Ranch home's architectural characteristics of a long, low-sloping roof line, an attached garage, and large front windows lend themselves well to adding an appealing front porch. You can achieve the same dramatic effect for your home. The largest hurdle is overcoming the usually low-sloping roof. Once that is resolved, you will have a lot of fun designing the remainder of your front porch - and we can help with both! First, a few words about roof slope (often called pitch or rise and run). The lower (or flatter) the roof the more difficult it is to have a shed-type roof but it is mostly dependent on your geographical area. Be sure to check with your local building codes department to see what the minimum front porch slope is required for your local area. The following picture illustrates a shed roof on a home with a low roof slope. By starting the shed roof farther up the home's roof you achieve one, a more cost effective solution, and two, a deeper front porch. Had the shed roof been just an extension of the main roof, the front porch would not have had much depth as the overall height would have been limited due to the pitch of the roof. 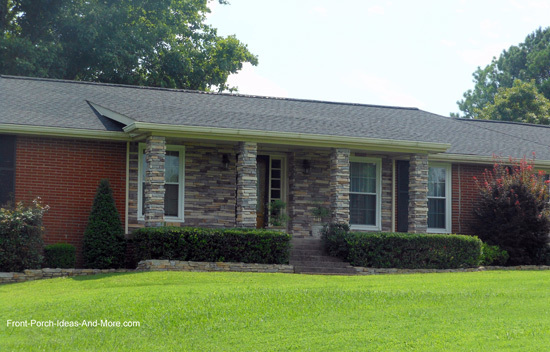 This cozy ranch home is one we see often when we take walks. The shed style metal porch roof is somewhat of an extension of the home's roof. 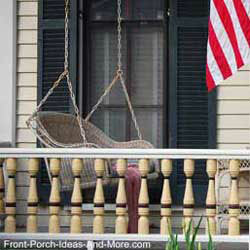 Hanging baskets, rocking chairs and a porch swing - what more could you want? Here's a neat variation of the shed roof and one that seems to be very popular. It actually looks like a partial-gable roof that starts the ridge board and extends over the front porch area. 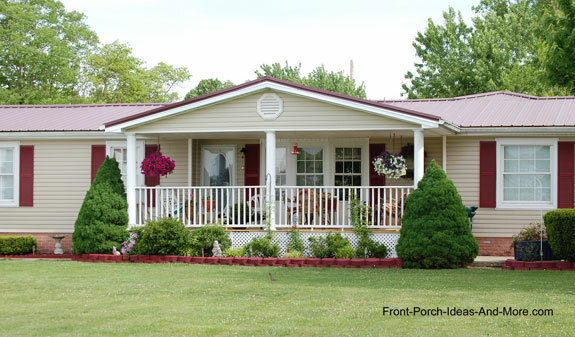 We are partial to ranch home porches with combination roofs like the one below. 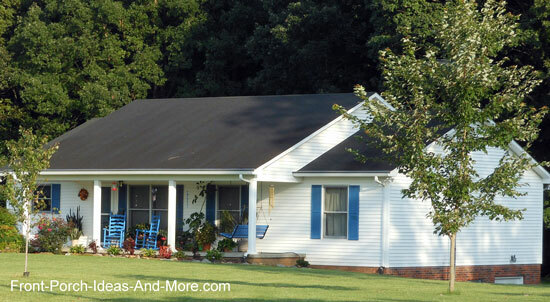 They tend to add a bit more appeal and interest by breaking the straight lines of typical ranch style roofs. 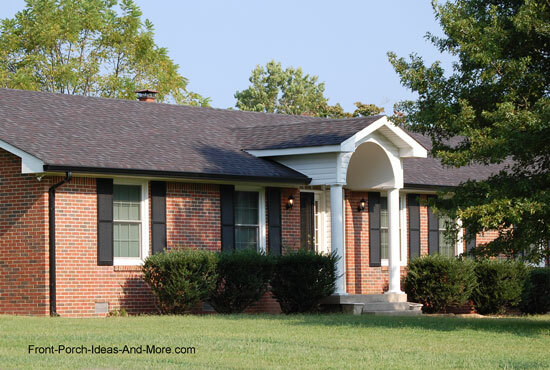 Another option for ranch home porches would be to construct a flat roof off of the main roof. This allows you to extend the depth of your front porch considerably. However, flat roofs may be restricted by local building codes in some geographical areas; be sure to check with your local codes department. 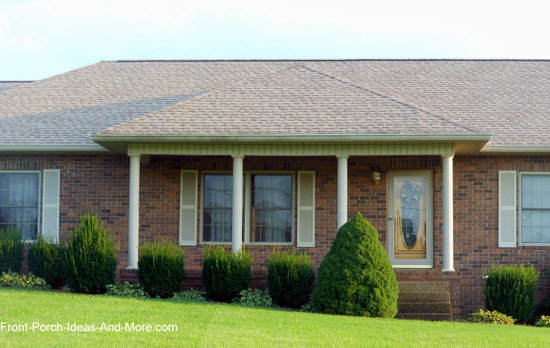 Hip roofs are another great option and make for an interesting porch roof design. Hip roofs have equal angled sides whereas a mansard roof (a variation of the hip roof) may have unequal sides. 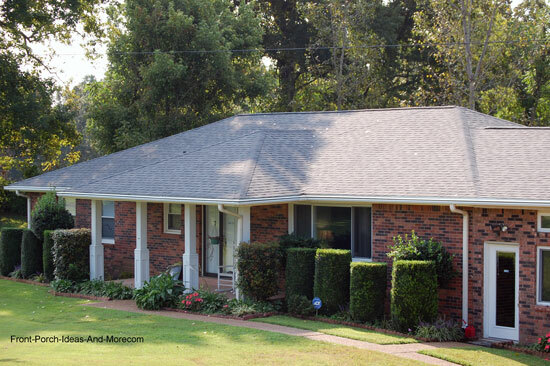 Either one can work well for ranch style homes but the mansard style roof offers more flexibility. 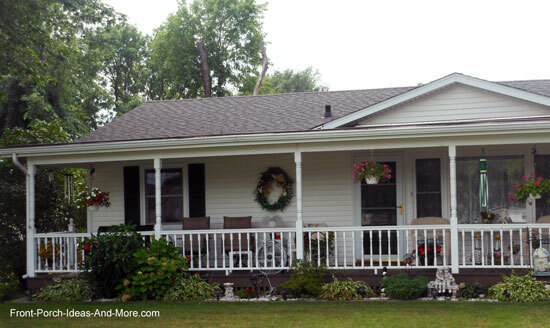 Here's an example of an aesthetically pleasing front porch with a mansard roof on a ranch style home. Again, the slope of your home's roof will dictate the style of your hip or mansard roof as evidenced in the photo below. Compare this with the mansard roof designs featured above. On a mansard roof, you can add depth to your front porch by extending the ridge board which will in turn extend the size of the angled sides. 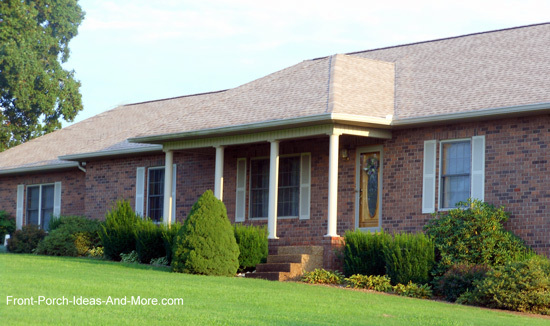 Clearly the most popular roof design for front porches on ranch homes are gable roof designs. Just like mansard roofs, to increase the depth of your front porch, extend the ridge board to the desired length. This can create an expansive outdoor room like the one shown below. When designing ranch home porches, consider the available light. Deeper porches will diminish the amount of light shining into your home. If you desire a deep porch and light, consider installing skylights on both sides of the gable to maximize the available light. 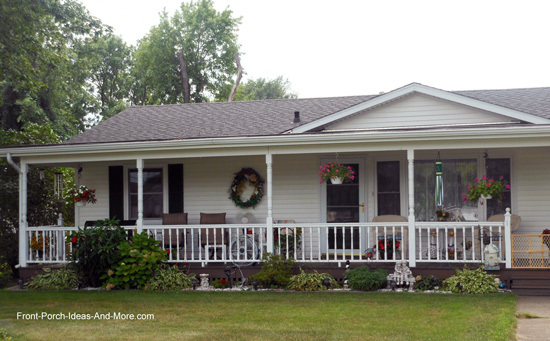 Jami and her husband Brian took their 1982 ranch home and turned it into a cottage charmer with a delightful front porch. 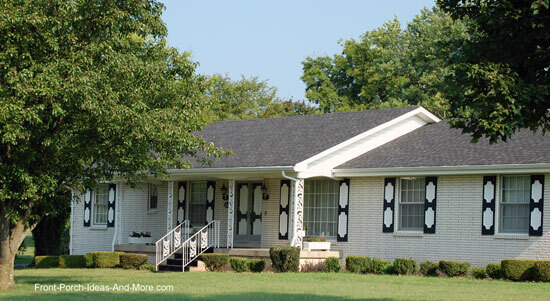 Here's a variation of the gable style ranch home porch roof which gives it a more contemporary appeal. It is important to note that subtle changes in roof designs can make dramatic differences. Bigger isn't always better. 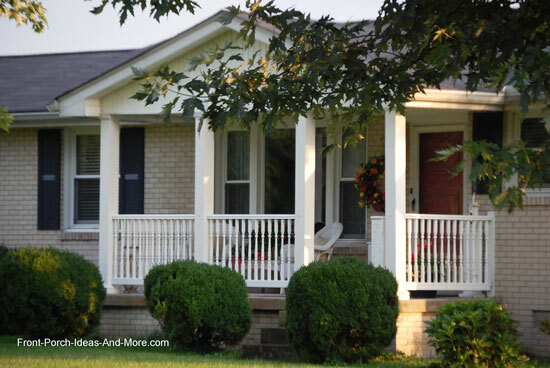 Even a small gabled front porch creates lots of curb appeal on ranch homes. Interesting variation. Do you see what I see in the photo below? 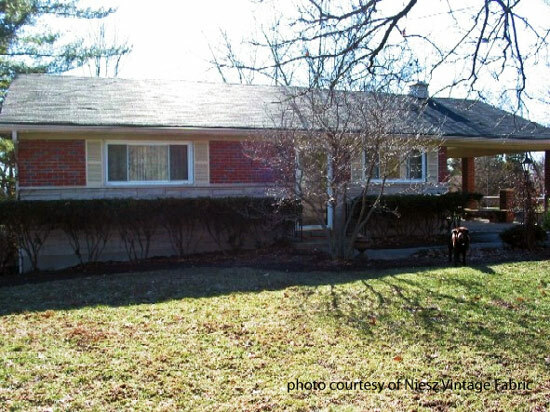 The photo above depicts a rather interesting gable roof addition to a brick ranch home. Note the placement of the original steps to the front door. Instead of moving the front steps to the outside of the porch, they erected the gable style roof over them giving this a very unique look. By doing so, they alleviated having to raise the entire porch to the door's level. 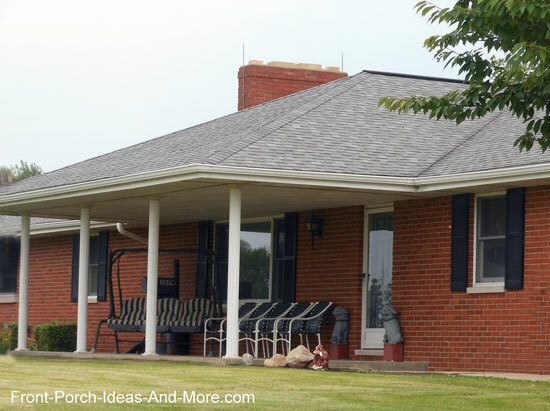 Yet, another option, and one that is primarily for new ranch home porches, is to raise your roof's pitch so that you can extend it to cover a front porch as shown below. 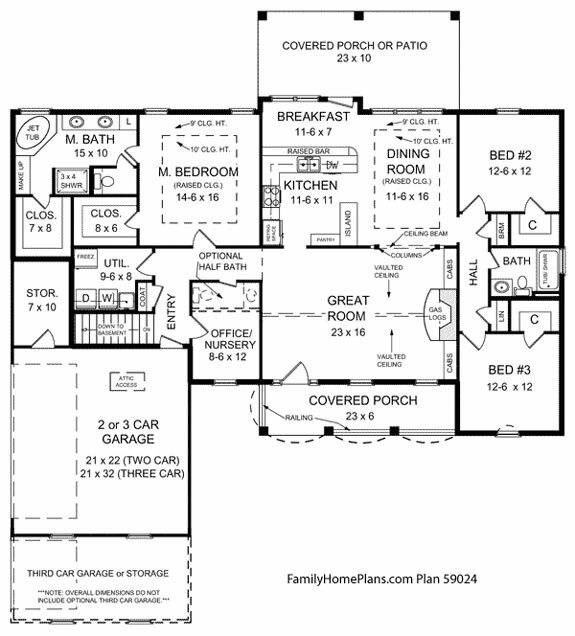 Looking for Ranch Style House Plans? 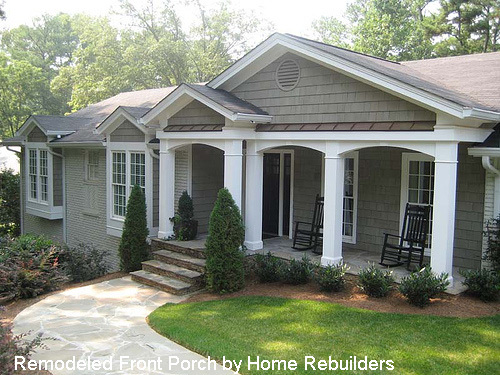 It isn't always easy to conceptualize how a new or remodeled front porch will look on your home. To assist you in seeing how much a front porch can change the look of a home, we've created what we call a "Front Porch Illustrator". 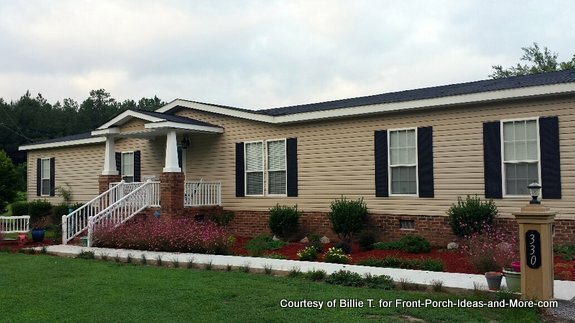 Our tool lets you see not only how much a new porch impacts both a one story and a two story home but also gives ideas for landscaping too. 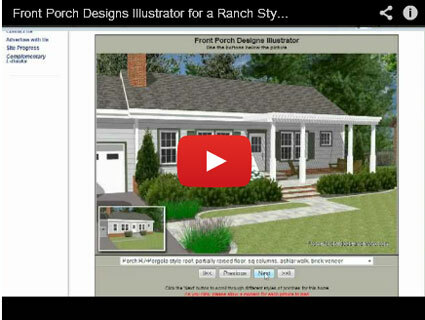 So be sure to check out our front porch design illustrator tool. 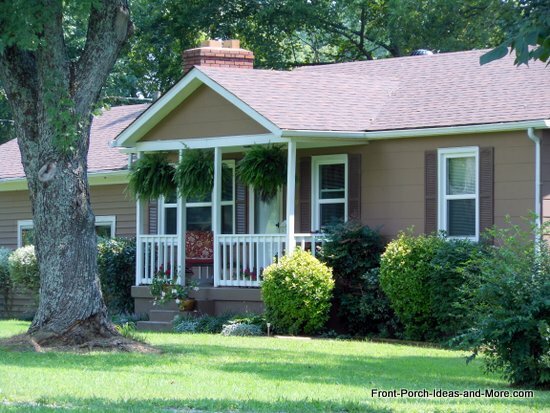 Once you determine the style of your front porch roof, it's time to consider adding the appeal. Curb appeal and functionality are the result of your roof, porch columns, porch railings, flooring, steps, and even landscaping. Fortunately or unfortunately, you have lots of options in every category. We can help! Choosing the right style of porch columns will increase your porch and home's aesthetic appeal. Larger round or fluted columns will give it a more sophisticated look, whereas square or rectangular porch columns present a more traditional look. Turned columns are ideal for giving your porch a more country appeal as will adding exterior house trim onto or between the columns. 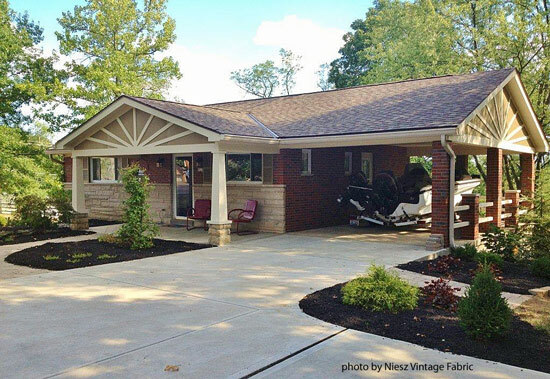 Before you decide on your porch column style, be sure to see our entire front porch column section to not only see a myriad of styles but also to choose column bases, materials, trim, and lots more. Like porch columns, you also have many porch railing options. Because of their design, many ranch homes offer the opportunity to forgo porch railings altogether to have what we call an "open" porch. Opting for no porch railings is also an option. As long as your porch is below 36 inches from the ground (check with your local building codes department) you do not have to have porch railings. This is a perfect option for those who don't want to inhibit their view. Are you ready to choose your porch railings? See all of your options before you make a definitive decision - we have oodles of information and photos of porch railings. See our entire porch railing section. Many people fail to consider their porch steps in the overall porch design. 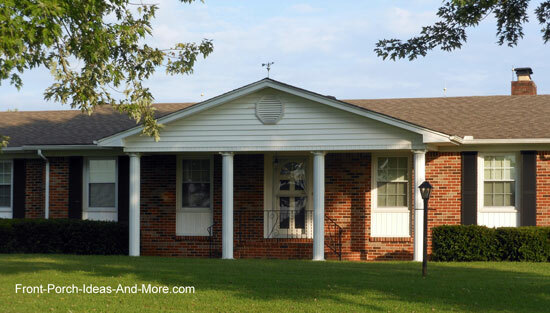 Ranch homes have an advantage in that most times very few steps are required. However, you should make the most of them and turn ordinary steps into extraordinary ones. One common mistake is making your porch step too narrow. You'll make a better impression if you extend the steps a bit to make them appear more expansive. Works well for a small porch too. 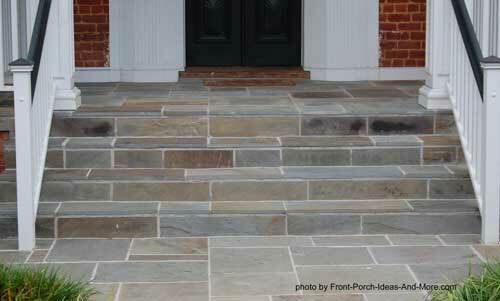 Be sure to see our entire porch steps section; you'll be pleased with all of the ideas we offer. 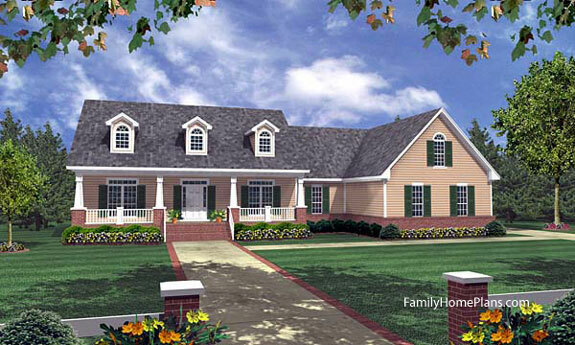 We've only just touched the surface for porches on ranch style homes. Enjoy all the information on our site and please send us pictures of your porch; we'd love to share them with others. 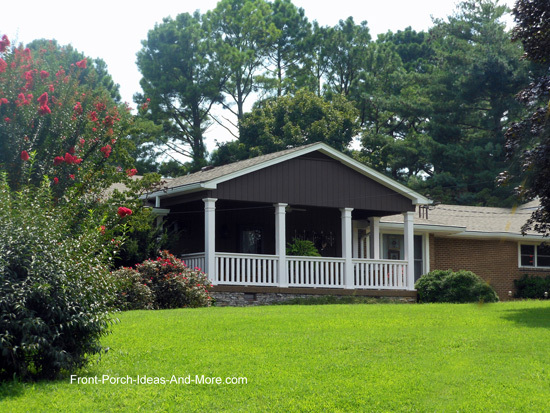 Enjoy finding your perfect ranch home plan -with a porch of course!